Situated on the lower slopes of Signal Hill, a short walk from the V&A Waterfront and minutes from Cape Town's beautiful beaches and historic centre, Port View House is your ideal base from which to explore the city. The beautiful gardens and sparkling pool create an oasis of calm in which to relax, or retreat to the cosy library for pre-dinner drinks, or enjoy breakfast on the deck overlooking the waterfront before starting your day's exploration. Port View House offers guests eight stylish rooms. Our six Select Rooms offer full en-suite bathrooms with both baths and showers, while our two cosy Standard Rooms offer en suite bathrooms with showers only. 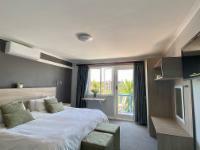 All rooms also offer direct-dial telephones, bar fridges, televisions and tea and coffee stations. Our Family Room is ideal for parents travelling with children. Port View House is 1.9km from the centre of Cape Town , the nearest airport 21.7km (Cape Town International Airport).